By way of background, digital audio workstation (DAW) applications that record input from music keyboard controllers are like word processor applications in that they allow you to correct mistakes. If you’ve hit the wrong note, played a note at the wrong time, or banged on a note with too much force, you have the ability to edit what you’ve done—delete or move notes, shift notes forward or back in time, as well as increase notes’ velocity (which translates to louder or software volume along with a change in the sound’s character or timbre). Additionally, if you’ve missed a note altogether (or would like to cheat by adding a string of them that you couldn’t possibly play by hand), you can simply add the notes you want. 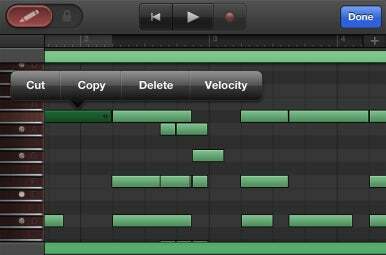 All this could be done in the OS X version of GarageBand but not the iOS version—until now. You don’t have to work on a note-by-note basis. Drag diagonally over a group of notes and you can move, change the duration, or change the velocity of all of them at once by adjusting any one of the notes. When you change notes’ velocities, they scale accordingly—meaning that if the first three notes were quiet and the next three a bit louder, their loudness relationship doesn’t change. Overall the notes will be louder or softer but the first three notes will still be quieter than the last three. String players who are reading along are, at this very moment, saying, “Tap and hold on a string and it keeps playing? Does Apple think we have infinitely long bows?” And they’re right, when you bow back and forth on one of these instruments, you don’t hear one long steady pitch. There’s some variation. But Apple’s got you covered. At the top of the fingerboard is a pizzicato/bow button. When you tap and hold on it and then tap on a string, that string plays pizzicato. Tap and hold on the button and then swipe up and down on a string and you bow it. (You can bow only one note at a time.) As with the Smart Strings’ chords, the faster you “bow” the louder the sound. If you’d like to bow throughout the track, simply double-tap on this button to lock it. Unlike with playing individual strings by tapping on them, in this bowed mode you don’t have the option to “play in the cracks” (play the tones between half-step pitches). You can play only the chromatic pitches. You can even get these articulations when playing an iPad’s Smart Strings instrument with an external music keyboard connected through Apple’s $29 iPad Camera Connection Kit (). In this case, move the keyboard’s modulation wheel all the way to the bottom and you’ll play a legato sound. Move the wheel to the half-way point and you play staccato notes. Push the wheel all the way up and the stings play pizzicato. I wasn’t briefed on this feature—I just happened to stumble upon it. And yes, it made me smile. 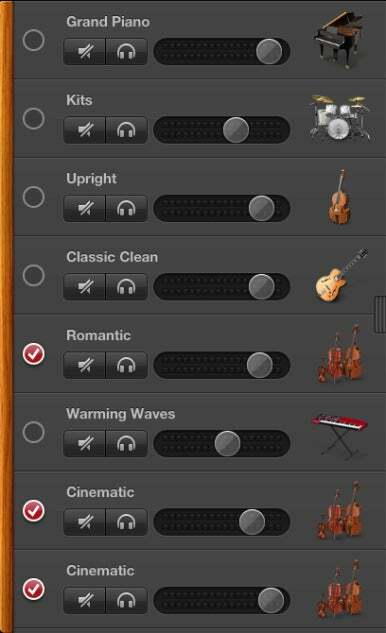 It’s very clever and shows a thoughtfulness for those musicians who prefer to play GarageBand with an external keyboard. The prerecorded patterns sound great. For individual instruments played solo, I prefer the sound of the lower strings. When you move into single note, bowing on the viola and violin instruments the notes can be a little boxy and over-rosined sounding—the kind of sound you might hear playing the instrument, but a timbre that’s not typical from a listener’s perspective. Just tap an instrument icon in the tracks window, and then tap the Merge button that appears. The instruments list shifts slightly to the right, and checkboxes appear next to each track. Enable the checkbox next to each instrument that you want to merge and then tap the Merge button in the top-right corner of the screen. The original un-merged song will be saved and a new song created that contains the selected tracks merged into one track plus any individual tracks that you chose to not merge. This is a great solution when your arrangement needs to stretch beyond eight tracks. Plus, it’s well implemented, as you don’t lose your original song. If you’re unhappy with the merge, you can undo it immediately or return to the original version of the song, which you find on the My Songs screen, if you later think better of the merge. GarageBand 1.2 also lets you more easily share your songs—not only with others in the world but also with your other iOS devices. The first option is available thanks to GarageBand’s new sharing options. Just go to the My Songs screen where you store your tunes, and tap and hold on a song file until the song thumbnails start shaking. When you do this, a number of icons appear in the top-left corner. The one you’re after is the Share icon. Tap it, and you find the options to share your song via Facebook, YouTube, SoundCloud, and iMovie. (The sharing options found in previous versions—iTunes and Mail—are also in this list.) When you upload your song to the first two services, the song is represented with a large frame containing the GarageBand icon. A SoundCloud upload produces a typical sound file in your SoundCloud tracks page. And when you choose iMovie, iMovie launches and your song is added to a new iMovie project. Music In the Air: You can now sync your songs via iCloud. As for sharing your songs with other iOS devices, you use iCloud. To share one song or more, tap and hold on a song until the icons start shimmying and then tap on any songs that you want to sync via iCloud. Now tap the iCloud icon that appears in the screen’s top-left corner and then tap Upload Song(s) to iCloud from the resulting menu. Each selected song displays an up-pointing arrow, indicating it’s being uploaded to iCloud. When the upload is complete, the thumbnail bears a cloud icon. Now move to another iOS device and take a gander at the My Songs screen in its copy of GarageBand. Any songs you’ve chosen to sync with iCloud will appear on this screen with a down-pointing arrow. Tap the song and it downloads to your device, ready to play and edit. When you edit a song and then return to the My Songs screen or leave GarageBand, the edited version is synced to iCloud as well as to any iOS devices that have a copy of that song. This is a very slick feature if you work on songs on multiple devices. Note that iCloud sync works only among iOS devices. It isn’t currently supported between the iOS and Mac OS version of GarageBand. 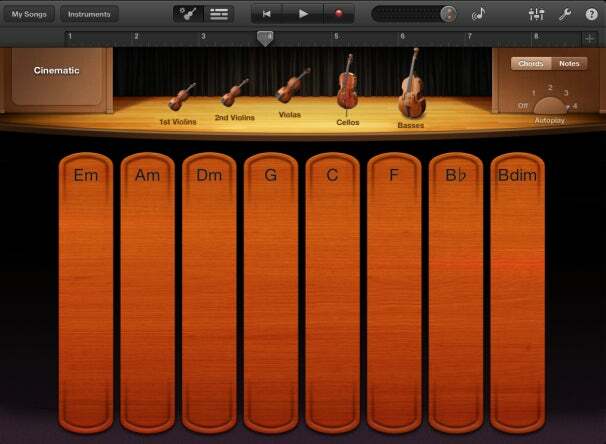 Playing with the iOS version of GarageBand was often a solitary experience. Drag in a drum loop, choose another instrument, and layer tracks, one after the other, until you were done. It was a great way to sketch out songs but not terribly satisfying if you prefer to play with other humans. 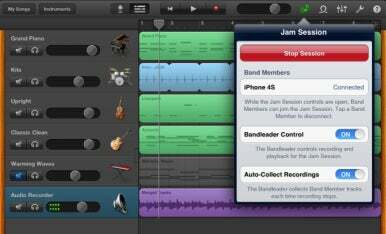 GarageBand 1.2 addresses this issue through its Jam Session feature—a feature that allows four people to play and record together on compatible iOS devices (iPhone 4, iPhone 4S, the fourth-generation iPod touch, and all iPads). 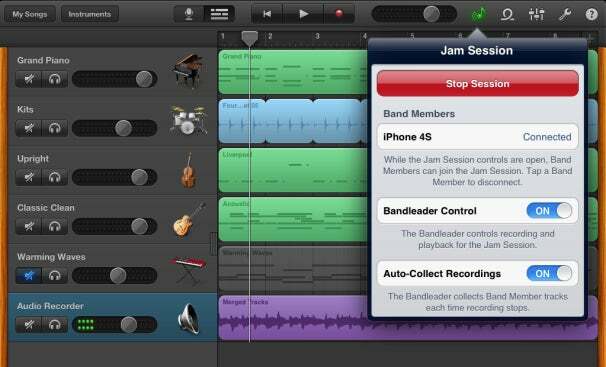 Let’s Jam: Setting up a jam session with the new feature in GarageBand 1.2. When everyone’s signed in, the leader closes the Jam Session window or screen. Each player then chooses an instrument and waits for the leader to tap the Record button. When he or she does that, everyone starts playing. You can hear what others are playing only through the speakers on their iOS devices (or sound system those devices may be plugged into). If you use headphones, you can only hear the part you’re playing. When the song is done, the leader taps the Stop button and, by default, all the tracks played on each device are copied to the leader’s device, where they appear as new tracks within the tracks screen. Tap Play on this device, and all recorded tracks play on the leader’s device. At the same time, each player will hear the track they recorded on their device through their device’s speaker or headphone jack. If you allow the default behavior, which is for tracks to be auto-collected by the leader’s device, then players can edit their tracks but those edits won’t be pushed to the leader’s device. If players want a chance to edit their tracks, the leader must switch off the Auto-Collect Recordings option in his or her Jam Session window. Players can then edit and when they’re through, the leader simply taps the Collect Recordings button in the Jam Session window, at which point the tracks will be transferred. Your band can also overdub itself. So, for example, with your four players, record drums, bass, guitar, and keyboards in one session. At the completion of that session, each member creates a new track with a different instrument—John chooses a Smart Guitar track, Paul opts to record a vocal track using his iPhone’s microphone, George jacks his Rickenbacker into an iPad-compatible audio interface, and Ringo is left to add maracas. Once again, the leader taps Record and the players play along with their previously recorded tracks. When the leader stops the recording, those four additional tracks appear on the leader’s device. Not only wow, but wow, it works as advertised. 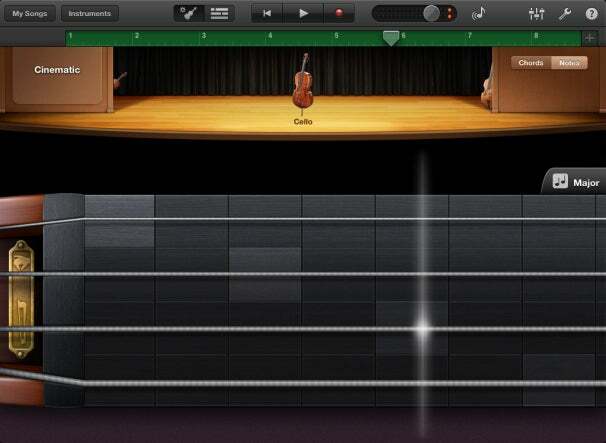 GarageBand 1.2 is another impressive step forward for this remarkable, must-have app. The ability to edit notes means the end of frustrating re-takes when you imperfectly play a part. 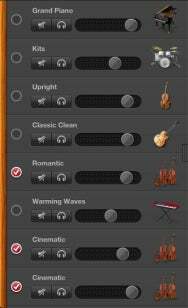 The Smart Strings instrument adds some welcome sweetening and drama. The new sharing and iCloud features make it easier than ever to make your music available to others. And Jam Session allows GarageBand musicians to leave the confines of their back bedroom and participate in one of life’s great pleasures—making music with others. Purchase GarageBand on the iTunes App Store by clicking HERE!! !